This cool product includes the Luvabeau doll and accessories. The Luvabeau doll is a blonde baby boy. He is interactive, so much fun to play with! He has true-to-life facial expressions and a funny personality. 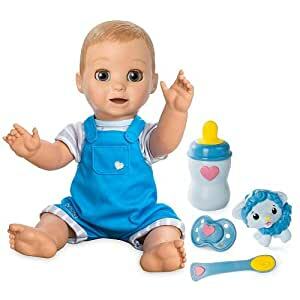 He moves, talks and plays just like a real baby. The more you play with him, the more he will talk! His babble will develop into over 100 clear words and phrases. He comes with 4 interactive accessories, a spoon, Lamby toy, pacifier soother, and bottle.